For nearly two decades, Brent Walker has fought to defend and extend religious liberty for all and uphold the wall of separation between church and state in our nation’s capital. First as the Baptist Joint Committee’s legal counsel and as executive director since 1999, Walker articulates a cogent Baptist understanding of the importance of the First Amendment’s religion clauses in protecting our God-given religious liberty. This collection of essays, speeches, sermons, and congressional testimony provides a living history of the modern era the life of the Baptist Joint Committee, now in its eighth decade. It includes historical essays dealing with the role of the pulpit in the fight for American independence, the involvement of James Madison and Thomas Jefferson in fashioning the First Amendment, and the contribution of numerous Baptists like Roger Williams and John Clarke to our understanding of the proper relationship between church and state. It also addresses specific religious liberty issues such as school vouchers, charitable choice, the Ten Commandments, religion in the public schools, attempts to amend the Constitution, including testimony he has given before House and Senate committees on these and other issues. 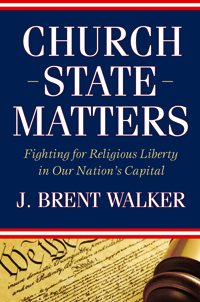 Both a lawyer and an ordained minister, Walker writes on church-state cases decided by the Supreme Court and about the justices themselves as well the theological underpinning of his passion for religious liberty. Sermons he has preached in Baptist pulpits across the land are also included.